Never Replace Your Shower Curtain Again because with a patterned glass wall around your shower or bath enclosure, you just need a sponge and some warm water to clean the interior after use. This creates a much more luxurious feeling in your bathroom, as you’re surrounded by a beautiful glass enclosure that catches light while providing you with more privacy. No more plastic curtains catching bacteria! More Privacy = Longer Baths – With patterned glass covering your shower, you can divide up your bathroom space for more people. That way if someone has to come in to grab a toothbrush, they’re not interrupting your relaxation time by kicking you out. Design permitting, your glass enclosure could actually help you conserve heat in your shower space for longer, if you choose to make the surrounding glass sealed. One of the many benefits of our boutique service is that we can build an enclosure that suits your needs for the space. 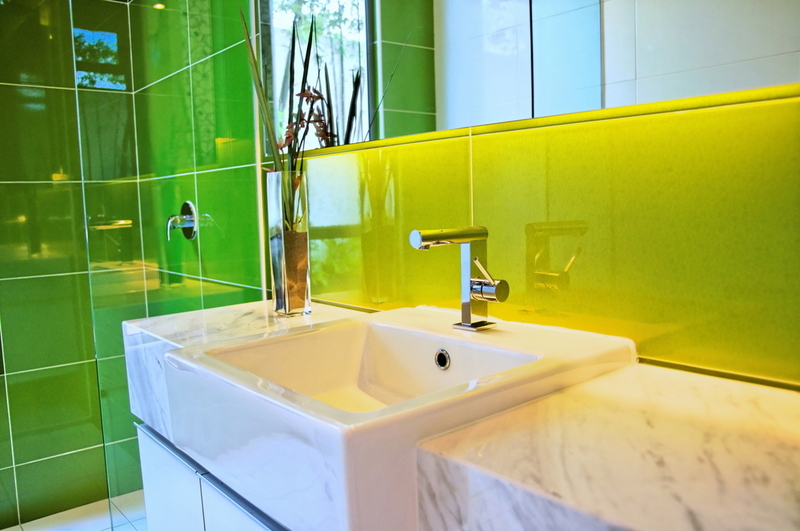 Why not consider a back-painted glass interior to go with the shower doors? Our back painted glass is a minimalist, chic alternative to tile that goes with any existing decor. Colours can be customised based on the look of the space, or one of our team would be happy to help you choose the right complimenting colours based on your ideas. Start your journey to a luxurious new bathroom today by calling us at (403) 253 3777 or visiting our Calgary showroom, (F#24, 5555 2nd St S.E. Calgary, AB T2H 2W4).